On a Saturday night when I lived in Madrid I’d often go to a football match or to a restaurant then wander around bars until around 2am. That’s the hour when the Madrileños were just getting started! So many locals in the city don’t head out until after 11pm when they start their evening in numerous bars before visiting nightclubs which stayed open until as late as 8am on Sunday morning. No wonder the city earned a reputation as ‘the city that never sleeps’. 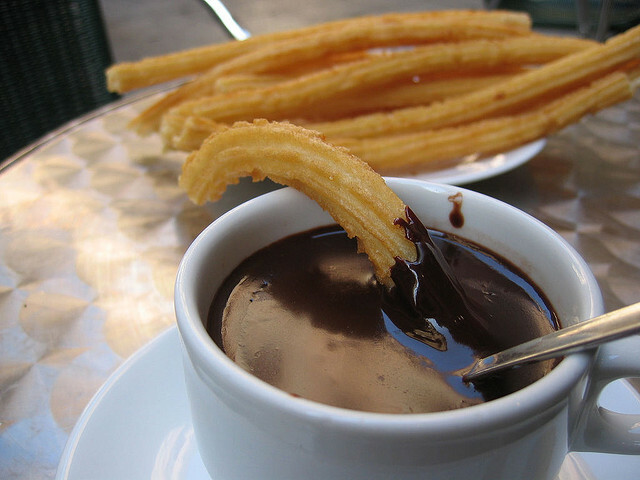 Thanks to this nocturnal lifestyle an institution emerged which is going strong to this day … ‘chocolate con churros’. What better way to get back some energy after a late night drinking in the capital than to fill up on thick, sweet chocolate with deep-fried dough pastry dipped in it. 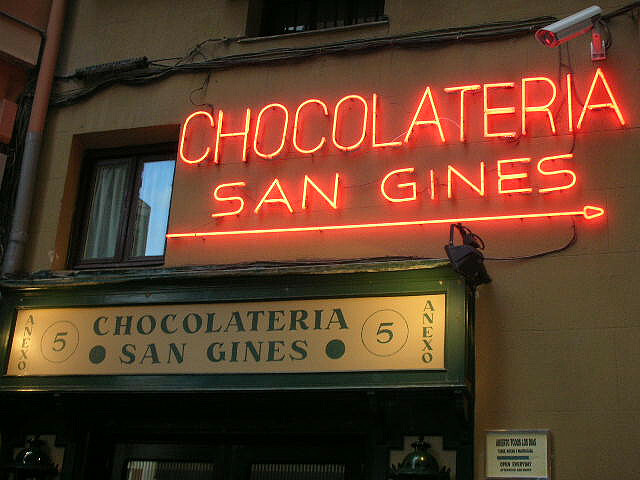 The most famous of Madrid’s ‘chocolaterías’ is Chocolatería San Ginés (Pasadizo San Ginés, 5) which has been serving this ‘chocolate con churros’ since 1894. Nowadays it is a popular tourist attraction located very close to Puerta del Sol and Plaza Mayor. In a small saucepan place all ingredients and heat, stirring constantly, over low heat until chocolate melts. Increase heat to medium and bring to a boil, stirring constantly. When the liquid bubbles to the top of the pot remove from heat and whisk gently until the bubbles subside. Repeat process, boiling then whisking, two or three times or more until the chocolate thickens and is frothy. Serve hot. Combine the sugar and cinnamon on a plate ready to roll cooked Churros in. Put the butter, flour, orange zest, sugar and 2/3 cup water and a pinch of salt in a heavy based saucepan. Stir over low heat until the butter softens and forms dough with the other ingredients. Continue to cook for 2-3 minutes, stirring constantly, until the dough forms a ball around the spoon and leaves a coating on the base of the pan. Transfer the dough to a food processor and, with the motor running, add the eggs. Do not over process, if the dough is too soft to snip with scissors, return it to the pan and cook, stirring over low heat until it is firmer. Spoon the dough into a piping bag fitted with a ¼ inch (0.6cm) star nozzle. Pre heat deep fat fryer to 350°F (175°C) or until a cube of bread browns in 15 seconds. Pipe 6 inch (15cm) lengths of dough into the hot oil a few at a time. Pipe with one hand and cut the batter off using kitchen scissors or a knife with the other hand. Cook the Churros for about 3 minutes, or until puffed and golden, turning once or twice. Drain each batch on paper towels,. While still hot, toss them in the cinnamon sugar and serve at once.